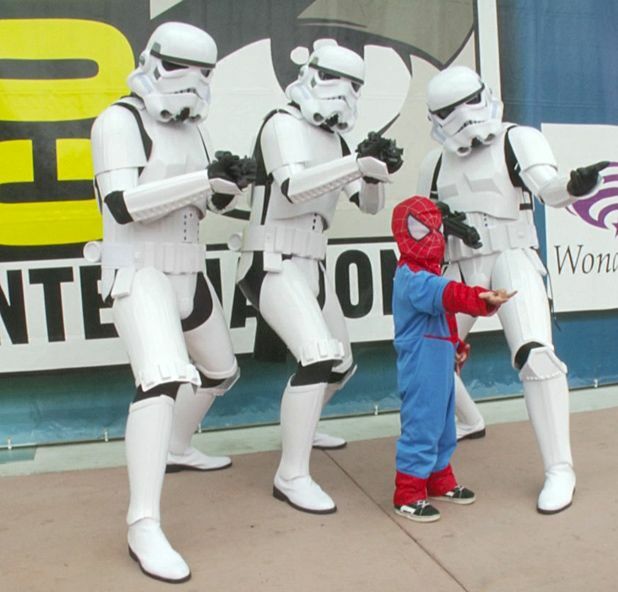 Comic-Con in San Diego is the world’s biggest sci-fi, comic and cult convention and Morgan Spurlock’s new documentary is the perfect guide to geek heaven. A place where fanboys and fangirls can feel normal and revel in their passions; there’s a wonderful sense of belonging and community as Joss Whedon states, ‘I have found my tribe’. Comic-Con has evolved from a few hundred people buying comics in the 70s to a celebration of pop culture, sci-fi, videogames, TV and action, where some of the biggest movies and TV shows play their first ever trailers to their most fanatical followers. It’s become the place to make big announcements and get the internet chattering. There’s an interesting tension from the old guard as comics have become the underdog, lost amongst the throng, while movies have stolen the limelight with their flashy premieres and A-list celebrities. Comic/movie superstars like Stan Lee, Todd McFarlane, Robert Kirkman, Eli Roth, Kevin Smith, Frank Miller and Guillermo del Toro all show up professing their love of Comic-Con, but most of the runtime focuses on the attendees as the ownership of these cultural icons (from Star Wars to Spider-Man) has moved from the creators to the fans: they now exist as part of the public consciousness. We get aspiring artists, comic dealers, cos-players, toy collectors and probably the sweetest, nerdiest marriage proposal of all time. They also prove there’s a fine line between passion and obsession, but mainly they come across as a warm, inviting crowd with a wealth of (very specific) knowledge. The United Nations should take notes (as Jen Soska so rightly points out): when you see Marvel happily rubbing shoulders with DC or Star Wars fans chatting to Star Trek fans it makes you proud to be a geek. Comic-Con Episode IV: A Fan’s Hope is showing at the GFT, Wed 20 Feb & CCA, Glasgow, Thu 21 Feb, as part of Kapow! at the Glasgow Film Festival.